Heart disease is the leading cause of death in the U.S., according to the CDC. Not so coincidentally, two-thirds of our food consumption now consist of three grains: wheat, rice, and corn. Both the increase in heart disease and grain consumption are products of our modern agricultural system. In the hunter-gatherer era, heart disease was virtually nonexistent and so were farmed crops. However, this correlation was ignored for several decades by leading health and nutrition institutions, who blamed dietary fat for the rise of obesity and cardiovascular disease instead. 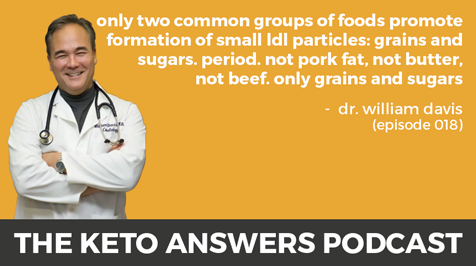 Dr. William Davis was one of the first physicians to go against traditional nutrition dogma and denounce grains and sugars in his NYT best selling book Wheat Belly. Dr. Davis was practicing as an interventional cardiologist when he began the research that would lead him to discover just how much damage grains do to our health and quality of life. He and his team brought the first scanner to Milwaukee that could measure plaque in the coronary arteries of the heart, which was impossible to do before. Later on, he’d discover that LDL particles were raised by grains and sugars instead of the fat that was demonized back then. He also realized conventional cholesterol testing and its interpretation by physicians was outdated and ineffective. This put him on a quest to find better testing methods and health markers that could predict disease more accurately. Dr. Davis has now written multiple books about the link between grains and heart disease, — including the Wheat Belly series and Undoctored — and is the founder and medical director of the Wheat Belly Lifestyle Institute. Today Dr. Davis and I delve deep into the risk factors of heart disease, the real impact of grains in our health, what cholesterol truly indicates, why our healthcare system is compromised by big pharma, and what we can do about it. What is Lipoprotein(a) and what happens to people who have it? How much vitamin D and omega 3s should you eat per day for optimal health? The special yogurt Dr. Davis eats every day for optimal gut health — and how you can make it at home. Dr. Davis’ books, Wheat Belly, Wheat Belly Total Health, Wheat Belly 30-Minute (Or Less!) Cookbook, Wheat Belly Cookbook, and Wheat Belly: 10-Day Grain Detox.